Thanks to Lung Hsiang, the IPC co-chair and the Local Organizing co-chair of ICCE 2012. 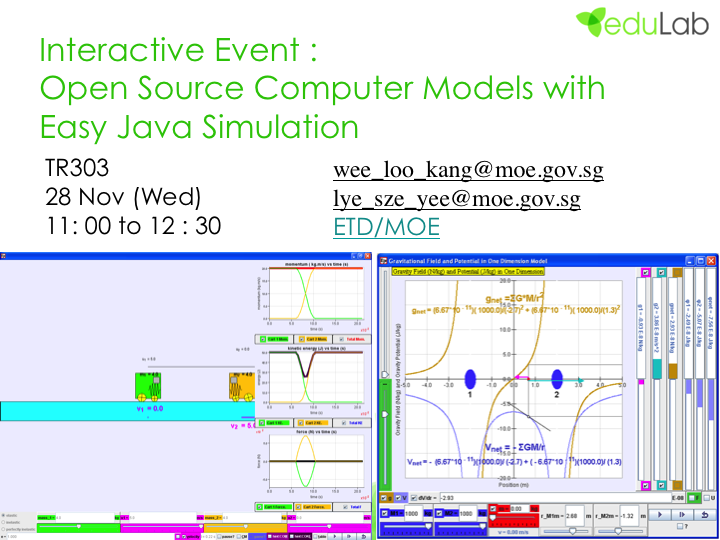 This 3(to 1.5 cut by organizers) hour interactive hands-on workshop aims to cover the basics of the free authoring toolkit called "Easy Java Simulation" organized by Loo Kang Wee and Sze Yee Lye from the Ministry of Education, Educational Technology Division, Singapore. 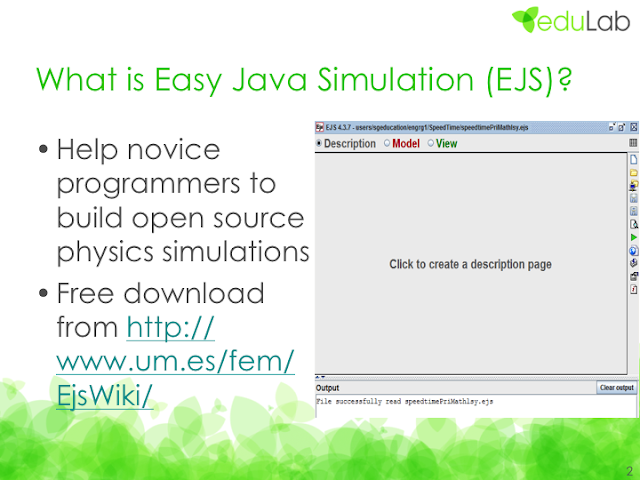 Participants will go through an model building process on a simple spring mass system in the tutorial called Modeling Science Textbook Chapter 2: Introduction to Easy Java Simulations by Wolfgang Christian and Francisco Esquembre. Lastly, participants will also 'tinker' with the codes and construct their design ideas into the model of their choice together with the workshop facilitators. 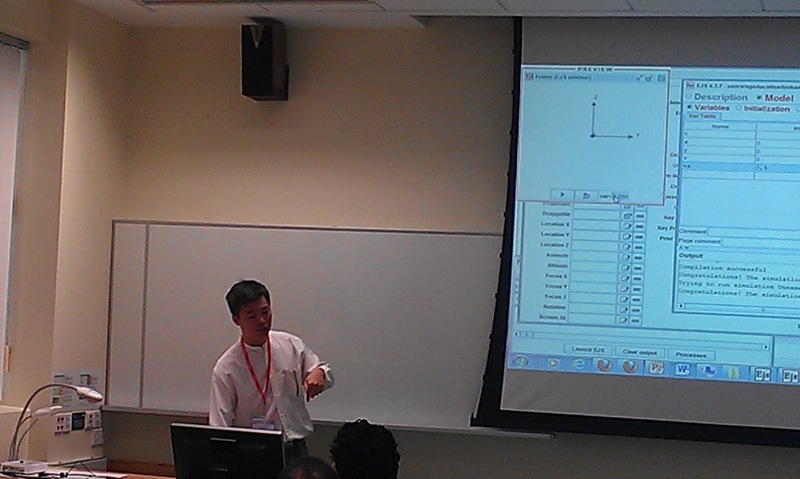 use SDL and CoL strategies to create customized or new models. 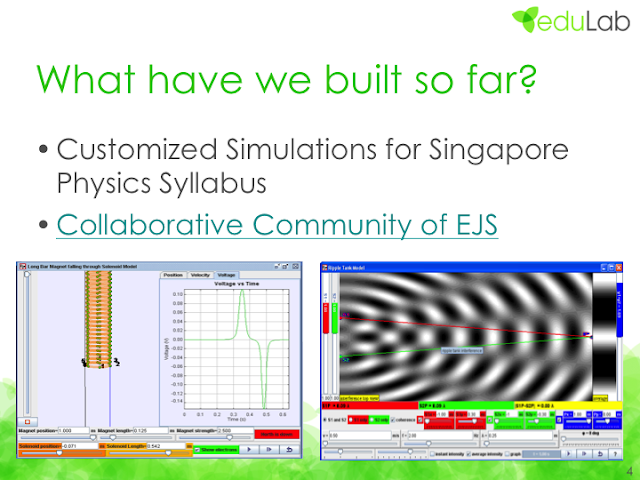 The Open Source Physics community (http://www.compadre.org/osp/) has created hundreds of physics computer models (Wolfgang Christian, Esquembre, & Barbato, 2011; F. K. Hwang & Esquembre, 2003) which are mathematical computation representations of real-life Physics phenomenon. Since the source codes are available and can be modified for redistribution licensed Creative Commons Attribution or other compatibile copyrights like GNU General Public License (GPL), educators can customize (Wee & Mak, 2009) these models for more targeted productive (Wee, 2012) activities for their classroom teaching and redistribute them with the world. Figure 1. 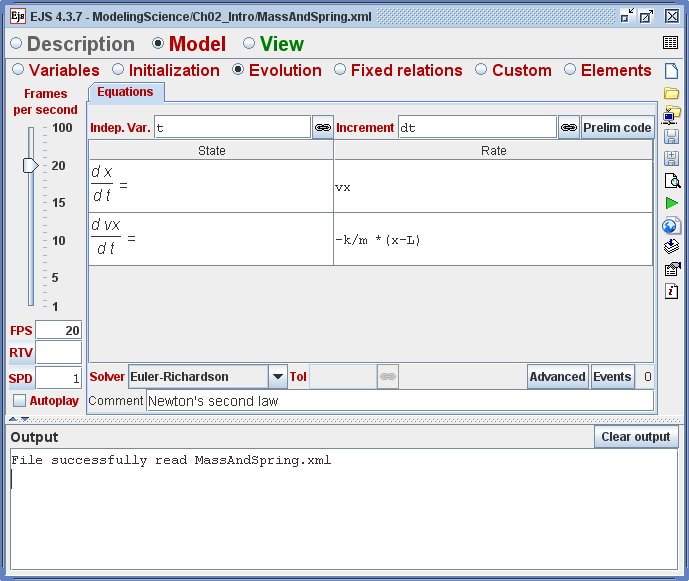 EJS authoring toolkit version 4.3.7 showing the Evolution Page with the Ordinary Differential Equations to model a simple spring mass system. The goal of the Open Source Physics (OSP) project is to make a large number of simulations together with source code available for education using the GNU General Public License (GPL) open-source model. OSP provides both high-level modeling tools and a lower-level computational physics library to create computer simulations through the use of a consistent object-oriented framework (Wolfgang Christian & Esquembre, 2012). The Java-based OSP library defines objects to build interactive user interfaces, draw 2D and 3D objects, numerically solve ordinary differential equations using different algorithms, and represent data using tables and graphs. This workshop provides a hands-on beginners’ introduction to Open Source Physics (OSP) and Easy Java Simulations (EJS) to model physical systems. 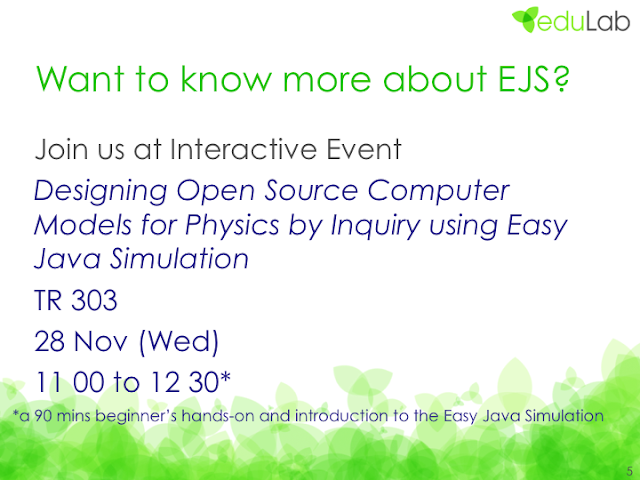 It is a hands-on practical sessions where participants will work on computer models provided. Participants will study and explore, step by step, important computational example of the spring mass system model (Wolfgang Christian & Esquembre, 2008a, 2008b), to learn how they have been implemented, and then modify these examples to add new capabilities. Assistance will be provided during the sessions. There after, the organisers hope to get participants to identify and self direct (Tan, Shanti, Tan, & Cheah, 2011) their own personally motivating computer model from the OSP and NTNU digital libraries and work collaboratively (Chai, Lim, So, & Cheah, 2011) with the OSP community to create customized or new models. 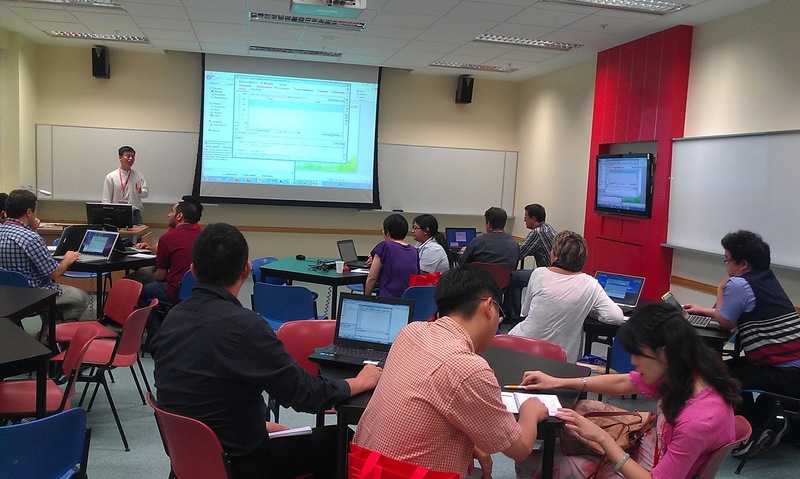 During the workshop we will discuss the general pedagogical and technical issues in the design of interactive computer-based tutorials as well as how existing models can be adapted to Singapore school context. 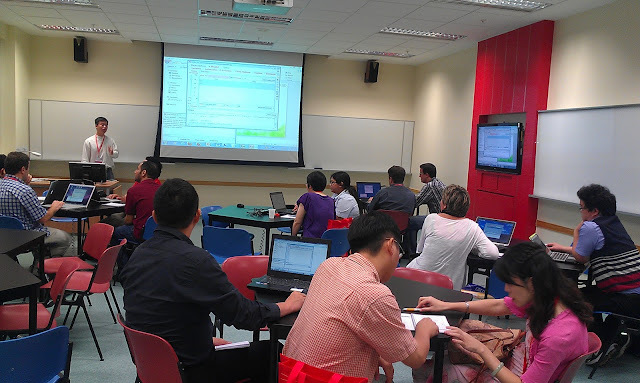 All workshop material will be made available through our blogshttp://weelookang.blogspot.sg and http://iwant2study.org/easyjava . • Participants download a simulation that is personally motivating to them from OSP Digital Libraries, that they want to edit and improve on even after the workshop, in collaborative group of 2-3. Wireless access VI. Conclusion This is a series of professional workshops that is conducted by the interactive event leaders in a funded project by NRF2011-EDU001-EL001 Java Simulation Design for Teaching and Learning, (MOE, 2012b) awarded by the National Research Foundation in collaboration with National Institute of Education, Singapore and the Ministry of Education (MOE), Singapore. Our computer models are downloadable on NTNU Java Virtual Lab (F.-K. Hwang, 2010) creative commons attribution licensed and lesson packages on the ICT Connection edumall 2.0 portal under ICT-in-ACTION http://ictconnection.edumall.sg/cos/o.x?c=/ictconnection/ictlib&uid=200&ptid=711 (edumall 2.0 login required). We hope other educators will share their own creative works with the world as demonstrated by the key originators Francisco Esquembre, Fu-Kwun Hwang and Wolfgang Christian and the passionate (interactive event leaders included) community of the Open Source Physics Project. AcknowledgementWe wish to acknowledge the passionate contributions of Francisco Esquembre, Fu-Kwun Hwang and Wolfgang Christian for their ideas and insights in the co-creation of interactive simulation and curriculum materials. 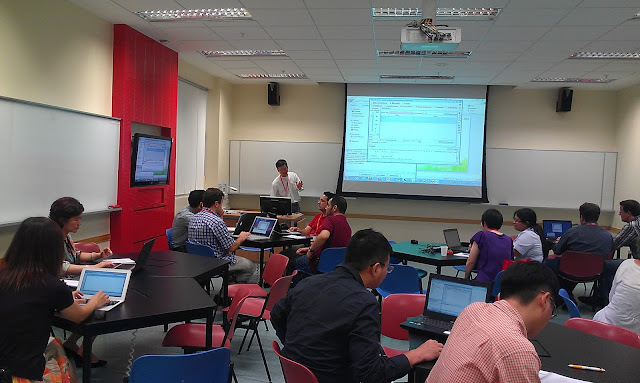 This workshop research is made possible thanks to the eduLab project NRF2011-EDU001-EL001 Java Simulation Design for Teaching and Learning, (MOE, 2012b) awarded by the National Research Foundation in collaboration with National Institute of Education, Singapore and the Ministry of Education (MOE), Singapore. Lastly, we also thank MOE for the recognition of our research on the computer model lessons as a significant innovation in 2012 MOE Innergy (HQ) GOLD Awards (MOE, 2012a) by Educational Technology Division and Academy of Singapore Teachers. Christian, W., & Esquembre, F. (2008a). Modeling Science Textbook Chapter 2: Introduction to Easy Java Simulations. Christian, W., & Esquembre, F. (2008b). 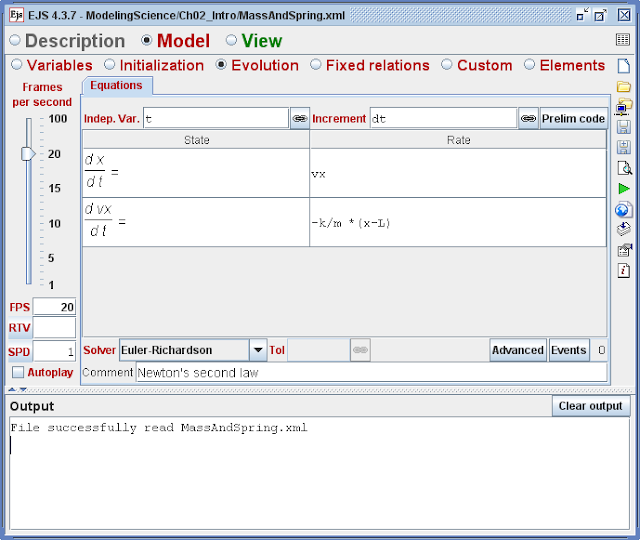 Modeling Science Textbook Chapter 3: EJS and Java Concepts Modeling Science: From Free Fall to Chaos. Christian, W., & Esquembre, F. (2012, Jul 04, 2011 - Jul 06, 2011). 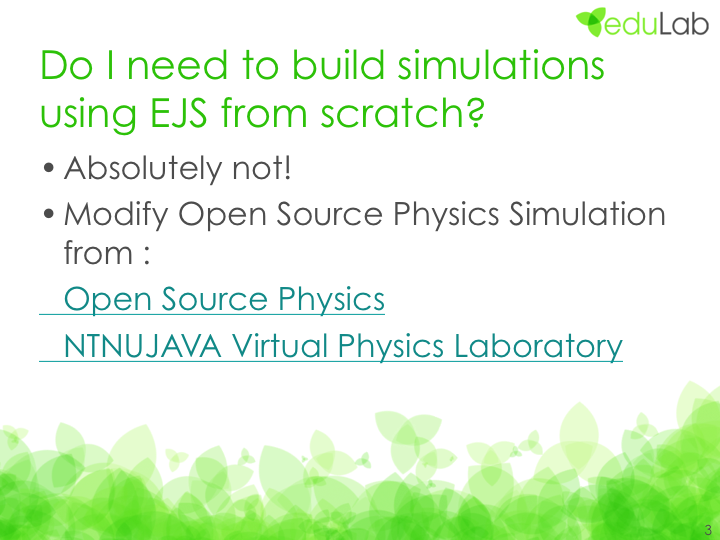 Computational Modeling with Open Source Physics and Easy Java Simulations. Paper presented at the South African National Institute for Theoretical Physics Event, University of Pretoria, South Africa. Christian, W., Esquembre, F., & Mason, B. (2010). Easy Java Simulations and the ComPADRE OSP collection. NUOVO CIMENTO- SOCIETA ITALIANA DI FISICA SEZIONE C, 33(3), 33-42. Wee, L. K. (2012). One-dimensional collision carts computer model and its design ideas for productive experiential learning. Physics Education, 47(3), 301. 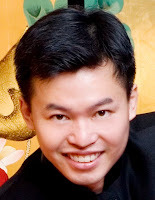 Loo Kang WEE is currently an educational technology specialist at the Ministry of Education, Singapore and a PhD candidate at the National Institute of Education, Singapore. He was a junior college physics lecturer and his research interest is in Open Source Physics tools like Easy Java Simulation for designing computer models and use of Tracker. Sze Yee LYE is currently educational technology officer at the Ministry of Education, Singapore. She was a primary and secondary physics teacher and her research interest is in free tools for technology use in education. Thank you for submitting the interactive event proposal to ICCE 2012. We are glad to inform you that your interactive event proposal is accepted. You are requested to make a web page for your interactive event, and we will publish your interactive event on the official web page of ICCE 2012. In ICCE, we adopt the "volunteer spirit" policy. All the event organizers serve ICCE for free, and all the participants (including the conference chairs, theme speakers, workshop chairs etc.) need to pay the registration fee. The main conference early bird registration deadline is October 1, 2012, for your information. Thank you again for your contribution to ICCE 2012, and we look forward to seeing you in Singapore. The 20th ICCE is around the corner. See you in Singapore in a few days’ time! Here are a few tips and heads up for your attention, which we hope will bring you a more pleasant and fruitful experience in the conference. Abstract Book: http://www.lsl.nie.edu.sg/icce2012/wp-content/uploads/2012/11/ICCE-2012-ABSTRACT-Book.pdfYou will also receive a hard copy of the conference booklet from the registration counter upon your arrival. Meanwhile, we will NOT provide the hard copy of the abstract book as part of our efforts to save the trees (and to reduce the weight of your conference bag J ). If you are keen, you may print out the abstract book at your home or office, or copy it to your laptop/ tablet/iPad, and bring it to the conference. (1) Venue: The National Institute of Education (NIE) campus where ICCE will be held is comprised of seven blocks. There will be another international conference —World Association of Lesson Studies [WALS] Conference – held in the same campus within the same period of time. So, don’t go to the wrong venues or eat the ‘wrong’ food (do check the signage first!). ;-) · Most of our sessions will be held in Blocks 2 3 (while WALS conference will be held in Blocks 5 and 7). Exceptions are plenary sessions (opening and closing ceremonies, keynotes and invited speeches) on Nov 28 (Wednesday) and Nov 30 (Friday), which will be held at Lecture Theatre 1 (LT1), located between Blocks 5 and 7. The plenary sessions on Nov 29 (Thursday) will be held at LT7 and video-streamed in LT8 (both within Block 2). · Your lunches will be served at the southern end of the NIE canteen, right next to Block 3. · We will provide directional signage to assist you. You may also refer to the maps in the conference booklet (pp.106-107). · Do wear your conference name tag while attending all our events and having conference meals. (2) Weather: It’s the beginning of rainy season in Singapore. Don’t leave home or hotel without your umbrella or raincoat, just in case! (3) Gentle Reminder to presenters and poster presenters: Laptops and projectors will be available in the rooms for keynote speeches, invited speeches, panels, parallel sessions, workshops and DSC’s. If you wish to present your work with your own laptops, tablets, iPads or iBooks, don’t forget to bring the power adaptors and cable adaptors needed.Laptops will NOT be provided for e-poster presentations – please bring your own machines and connect them to the flat panels in the rooms. All the e-posters and physical posters can be set up at their respective rooms half an hour prior to the assigned session. (4) Main Conference will Kick-start in the Morning of Nov 28: Our pre-conference days are Nov 26-27 (Mon-Tue), and main conference days are Nov 28-30 (Wed-Fri). We scheduled our Opening Ceremony in the afternoon of Nov 28 to avoid a time clash with WALS Conference’s Opening Ceremony. Nevertheless, our main conference will indeed commence in the morning of Nov 28.Apart from the pre-conference events, do join us from the beginning till the end of the main conference days. The Wednesday morning will bring you 4 parallel sessions (with 3 nominees of Best Paper or Best Student Paper Awards to be presented! ), 3 interactive events, 2 community building sessions, and the first poster session. What an exciting morning to kick-start the main conference! (5) Welcome Reception: Join us at the welcome reception as well, at 17:15-19:30, Nov 27 (Tue). 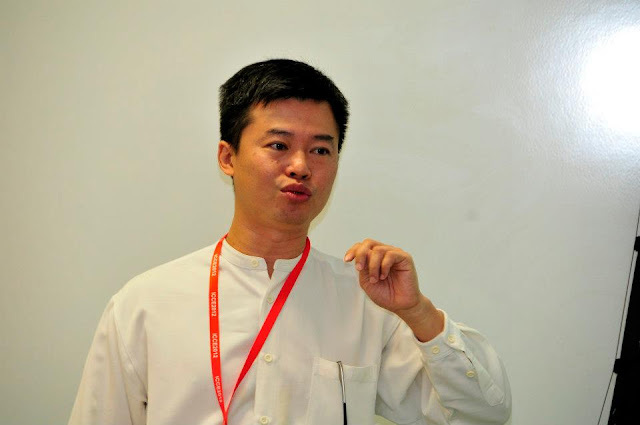 It’s included in your registration fee The Guest of Honor will be Prof. LEE Sing Kong, the Director of NIE. There will be a short ceremony to ‘kick-start the main conference’ and to make important housekeeping announcements. Afterward, you will have ample time to mingle with colleagues from all over the world and enjoy the buffet reception – roasted lamb, braised duck, local delights at live cooking stations (Malay Mee Siam, fried prawn, stir fried ice cream …), vegetarian fried rice, Chinese tim sum, seafood bouchee, croissant, Surabaya Lapis Cake, Tiramisu … The food are all halal. (6) Poster Sessions: Thanks to the state-of-the-art Tutorial Rooms in NIE, a new and novel feature in ICCE 2012 is the presentation of e-posters, apart from the conventional physical posters. This should increase interactivity between the poster presenters and the audience, and also give the poster presenters the option to make demonstrations of their software during the poster session. Do drop by the poster sessions at 11:00-12:30 and 17:00-18:30 respectively, on Nov 28 (Wed). 11 e-posters will be exhibited in the morning session and 8 more in the afternoon session; plus 60 other physical posters including 4 under the inaugurated “Special Poster Session on Technology-Enhanced Learning in Indonesia”. Come and witness these wonderful poster presentations which may bring you plenty of “Wow’s!” (7) Interactive Events: It had been quite a while since the ICCE conference series featured interactive events in the last time. This time round, we not only have one, but three events to keep you occupied, all on Nov 27 Wednesday morning! Drop by the Learning Sciences Lab Open House at Level B3 (Basement 3), Block 5 (09:00-12:30, Nov 27) – walk around the lab, meet different research teams, participate in hands-on demonstrations of new technology … and, breakfast will be served (throughout the entire event)!